This Time it's the Family! Well two days, four temples, 1, 44, 45 and 61. Only 84 left to go. Dad and Nathan really enjoyed being back on the Henro Trail and visiting the temples and roads again. Mom, Kayo and Isaac had a wonderful time experiencing a bit of way of the Henro; the stairs, the temples, the clean air, the stairs, the incense, the stamps, the stairs, the inns, the food, the stairs and so much more (not to mention more stairs.....) So until next time, the next temple and next stamp, Happy Henro-ing to All! 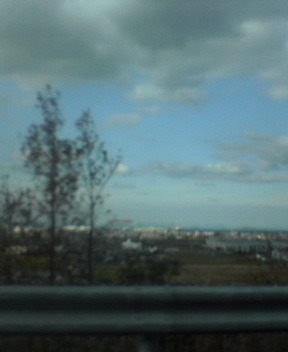 Driving along the northern highway of Shikoku with beautiful views of the Inland Sea. 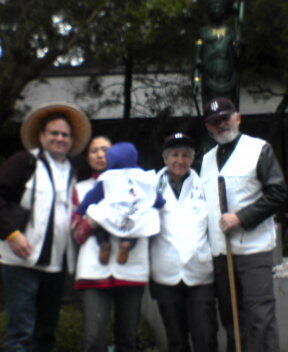 At Temple #61. 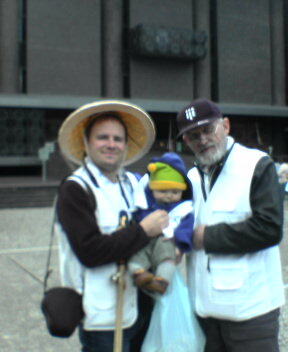 We had the Head Priest say a blessing for Isaac and then walked the grounds. Isaac was quite the star being the cutest Henro anyone has ever seen! 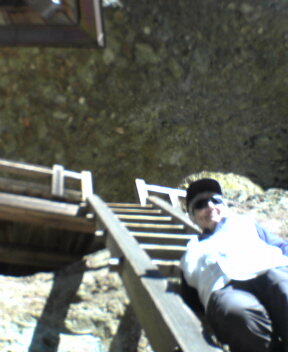 Mom climbs up the ladder at Temple 45 to check out the cave that Kobo Daish used to pray at. 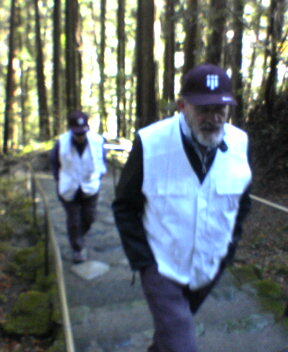 After driving over the mountain and down into the valley, we park and then walk back up the mountain using the steps to the temple. 50 down, only 300 to go! 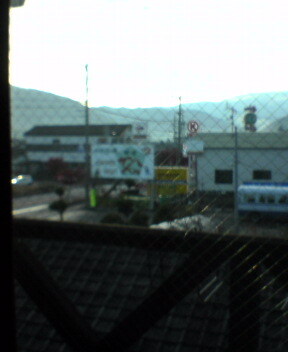 Gambatte! 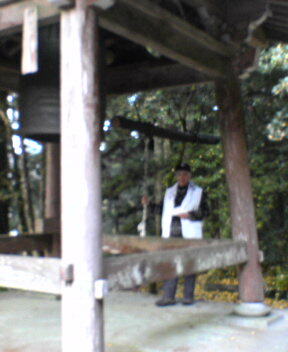 Mom gives the Temple bell a whack and makes sure that those of us that are not yet quite a wake now are! Booooooonnnnnnnnggggggggggggggg!!!!!!!!! Here we find two of the newest Henro members, Kayo and Isaac enjoying the crisp clean air at Temple 44. Let's all Henro! 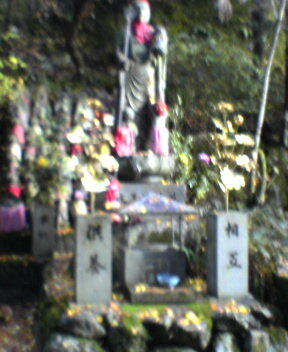 A beautiful statue of Kobo Daishi at temple 44. It was a crisp clear morning. Dad and I remember walking up here last year, quite the walk it was. 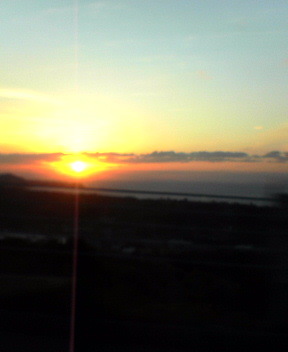 Was very nice driving up this time. After a rainy first day, we woke up to a beautiful Sunny Day! Perfect for doing the Henro! Closer to 44 actually, we hunt down room and board at Yasuragi Denko. 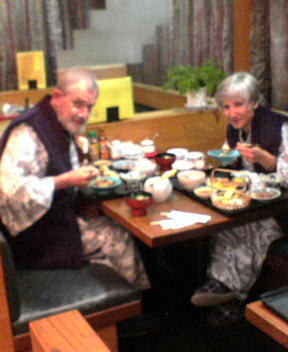 After a hot soak in the batch (bath, thank you Tamara), a wonderful meal and conversation with the owner. Slowy Henro Day. Deciding not to go back to the Highway, we take the back mountain roads towards 45. Three hours and one iPod viewing of Casablanca we arrive! 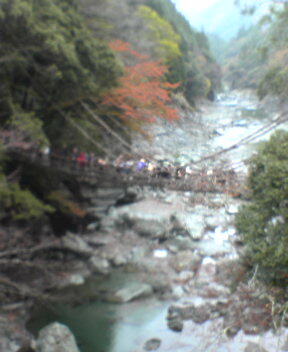 The famous Vine Bridge of Iya. Yes a wonderful sight to see, almost as impressive as the pictures in the tour books. 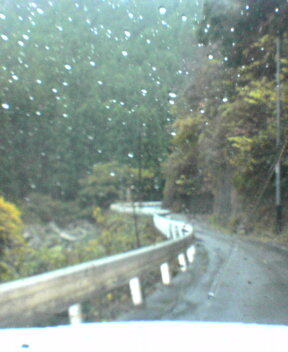 Actually first we wanted to take a visit to the Iya valley in central Shikoku. No temples there, but gorges and vine bridges. Everyone geared up and ready to Henro. Stamps done (actually Temple 1 comes pre-stamped) and ready to hit the road! 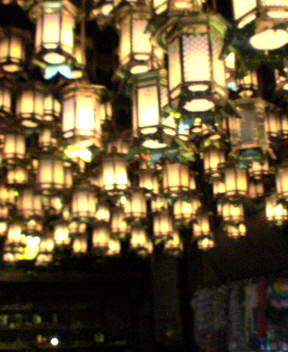 Beautiful lanterns inside of Temple 1. 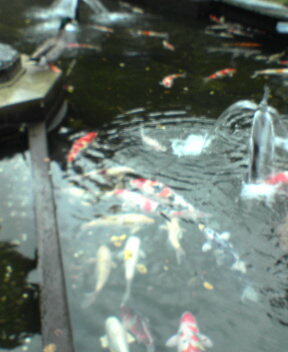 Here are the largest Koi any of us have ever seen anywhere. 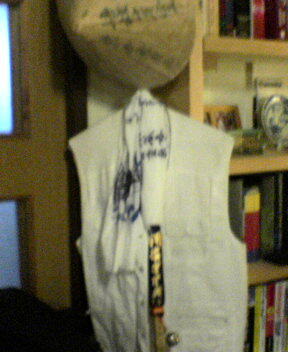 Isaac gets his Henro Vest. 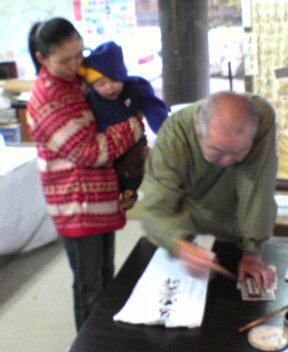 He even helped write the most important part "two people" representing a Henro Traveler and Kobo Daishi. 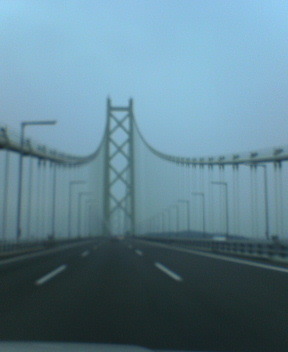 Crossing over the long, long suspension bridge to Awaji Island. 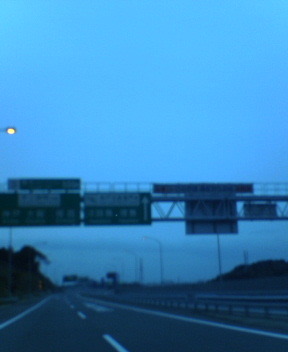 Here we are on the road from Kobe to Tokushima. 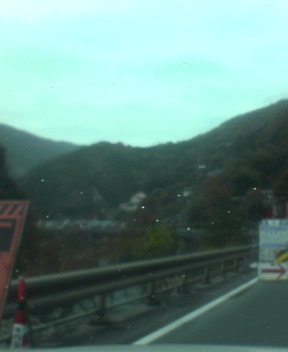 On our way to Temple #1. Last year around this time, my father and I were just getting back from our 16 day bicycle Henro Tour. 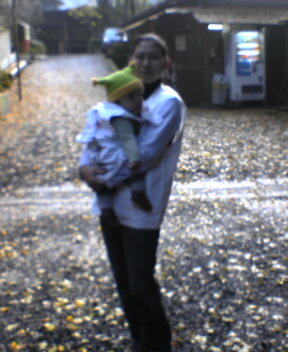 One of the things that I had asked at each of the 88 temples, was for Kayo and I to be blessed with a baby. I told them that if that miracle would happen, we would be back to give our thanks. Well as you all know, on May 9th, 2006, our wonderful son, Isaac Don Bryan came into this world. So with my Mother and Father visiting to meet him, we thought it would be a perfect time to brush the dust off of the Henro Gear, and pay our respects back in Shikoku. No, we won't be able to go to all 88 this time, but as a family we start a new journey. Jane Lewenthal on Family Henro 2006! Willa Pendergrast on Happy Henro! Willa Pendergrast on Family Henro 2006! Tamara Bryan Murphy on Happy Henro!